Part of the courtyard south of the cathedral is decorated by a monolith of black granite, erected in 1928 as a memorial to the victims of the First World War. There is also a replica of the bronze group of statues of St George (the original dating from 1373 is now in the National Gallery) and the Old Provost’s Office, which is located at the Palace of the Prague Bishops. The original appearance of this palace has been preserved on the surface of the facade from which part of the stonework and an associated Romanesque window from 1142 protrude. The original group of statues of St. George is the oldest preserved bronze equestrian statue in central Europe. Under the Old Royal Palace we come across Romanesque halls dating from 1135, when Prince Soběslav had his breathtakingly beautiful seat built here “in the manner of a Roman town”, as a contemporary chronicler recorded. A barrel vault spans the preserved cellar halls and it is possible to see the uncovered remains of a much older rampart fortification, perhaps dating from the 10th century. Originally, these rooms served as food stores, wine cellars and occasionally, as a prison or dungeon. The Gothic ground floor from the Luxemburg period is above the Romanesque cellars. It dates from the time of Charles IV (1333). Arcades, which Wenceslas IV had partially walled up (around 1400), opened onto the courtyard. 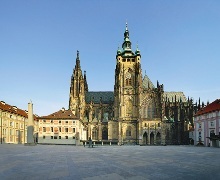 A series of halls is located behind them – the most notable is the Column Hall of Wenceslas IV (around 1400). Its Late Gothic-styled living area is one of the most luxurious in the palace. 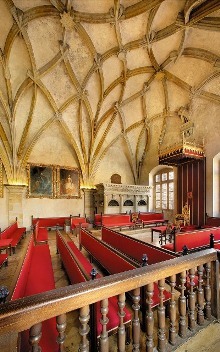 The Late Gothic and Renaissance floor is located above the Luxembourg Gothic ground floor. It mainly dates from the Jagiellonian period (1471–1526) and mainly served for courtly purposes from the earliest times. The outer windows and inner portals illustrate the first echoes of the Italian Renaissance in Bohemia. 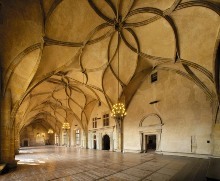 The Late Gothic Vladislav Throne Room dominates the whole floor. 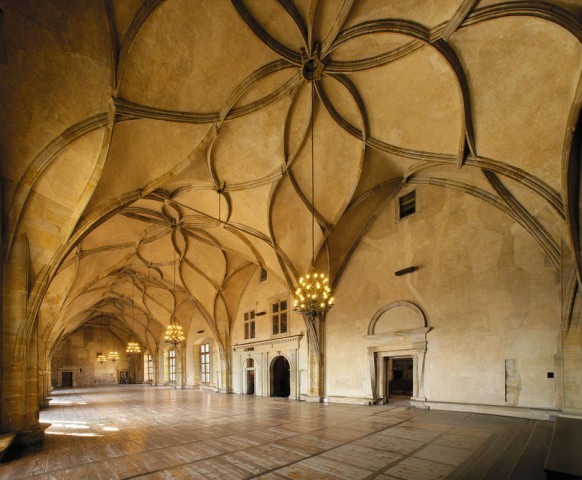 Architect Benedict Ried, replaced the original halls of the Luxembourg Palace between 1486 and 1502, creating the largest vaulted space without internal buttressing in the European world. This was the venue for coronation celebrations, representational banquets and ceremonies. Here you would find important parliaments assembled, tournaments taking place and luxury goods sold as well. Today, this is the venue for announcing newly elected Presidents of the Czech Republic and other significant political ceremonies. The seat of the Bohemian Court Office was located in the Renaissance-styled Ludwig’s Wing in 1509, named after Ludwig Jagiellon. 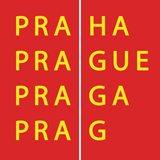 Czech Protestants threw the Catholic vice regents of the estates out of the window of the second room of the Bohemian Court Office on May 23rd, 1618. This protest against the erosion of provincial freedom and the limiting of religious tolerance marked the beginning of the Rising of the Estates and the resultant Thirty Years’ War. 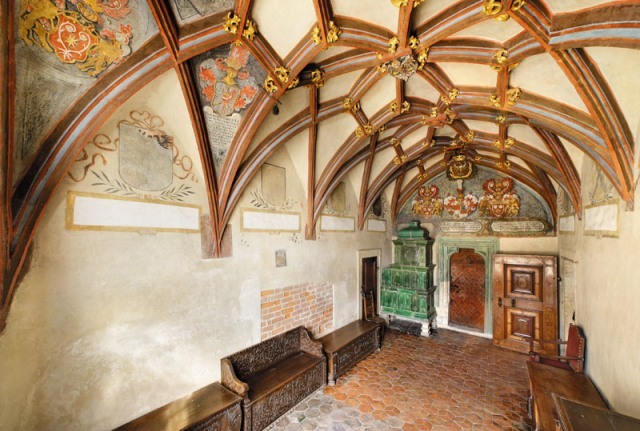 Late-Gothic Vladislav’s Bedroom is located in the wing above Wenceslas’ Columned Hall. 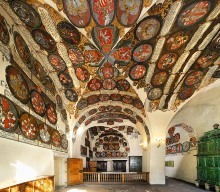 It is, in reality, a small audience hall, with rich stone and painted ornamentations dating from the late 15th century. The Church of All Saints adjoins the Royal Palace from the eastern side. Its original, 12th century Romanesque appearance made way for Gothic renovations, commissioned by Charles IV. In the late 14th century, architect Petr Parléř finished the church, which was destroyed by fire in 1541. In 1580, the church was restored, extended and directly connected to Vladislav Hall. In 1588, the remains of St. Prokop, Bohemian patron saint were placed here. He was the founder of Sázava Monastery, where the Great Moravian Old Slav Liturgy was kept until the end of the 11th century. The present-day fittings of the church are mainly Baroque, but the side altar triptych of the Holy Angels from the end of the 16th century is the work of an excellent painter from the Rudolphine Court – perhaps by Hans von Aachen himself.